Sir we are trying to run a 3.5 DC motor from the bolt device. The power is coming in the bolt and as soon as we connect the motor to GND and 7 port the power drops to zero (tested using a tester). Any way to transfer the same amount of power to the motor from the bolt ?? It is advisable to connect Bolt directly to the motors. Instead use a motor driver IC like L293D or use the Bolt Motor Shield. Check out the experiment on Interfacing Motors as shown in the Bolt online workshop. To access the workshop visit http://boltiot.com/developer_login.php and login using the same credentials as the Bolt forum. Ping here if you are unable to access the workshop. Sir, is there any way to do it without the motor shield as we have to submit a project tomorrow and we don’t have the motor shield. Any other alternative with the present default hardware ? You will either need a shield or relays (Check the experiment on interfacing relayes in workshop) or motor driver ICs. Sir if you are free can we come to inventrom and discuss ? Apologies. Please post any queries you have to the forum and we shall answer at earliest. We won’t be able to provide in-person or telephonic support. you have to use an motor drive like L293D or boltiot robotic shield which will take a low-current control signal and provides with a higher-current signal. This higher current signal is used to drive the motors. and motor need higher current signal to work properly. 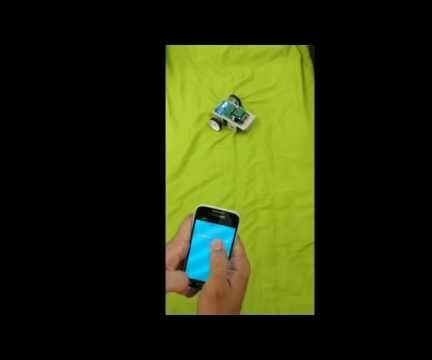 Internet Controlled Robot Using Bolt IoT Platform: This robot is built on the Bolt IoT platform and can be controlled over local wifi or through the internet from anywhere around the world!